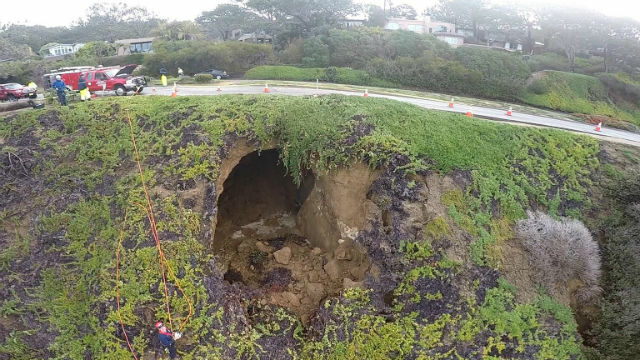 A scenic stretch Camino Del Mar remained closed Friday after this week’s El Nino-driven storms sloughed off bluffs in nearby Anderson Canyon and damaged an underground storm drain pipe. The southbound lanes, bike lanes and all but one northbound lane were closed between Carmel Valley and Del Mar Heights roads. City of Del Mar officials said estimates of the cost or required time for necessary repairs were not yet available. The roadway is intact, but the eroded bluffs are immediately adjacent to the western edge of the pavement. The damaged section of storm drain pipe runs underground along the west side of the Camino Del Mar, according to a city statement. City crews were working to divert the storm water flows that normally use the affected pipe and to protect other nearby utility pipes, officials said.